Russia’s leading lender Sberbank is ready to offer Russian Olympic winners financial aid and jobs at the bank if they decided to receive a new education in economics and finance after they leave their career in sport. 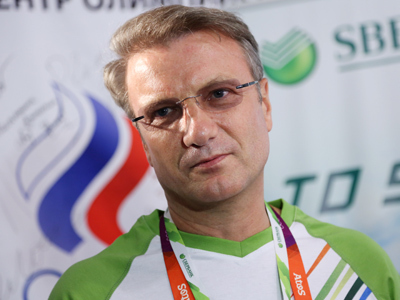 “All Olympic winners, who are thinking of dedicating their future to the world of business and finance when they end their athletic career, will be provided with all the necessary help in receiving a new education free of charge and will have a chance to become members of our team”, said the bank’s CEO Herman Gref in London “Sberbank is building an organization of champions. We want to be the best both in Russia and in the world” he added. Russia’s team ranked fourth at the Olympic Games in London winning a total of 82 medals, among them 24 gold, 25 silver and 33 bronze. Russian athletes won 8 medals in track and field, 4 gold medals in wrestling, 3 in judo, and 2 in rhythmic gymnastics and synchronous swimming. Gold medals were also won by volleyball players, in the rowing competition and in artistic gymnastics. Sberbank is the biggest bank in Russia and Eastern Europe with a 30 per cent share in the Russian banking system. It is also the official sponsor of the 2014 Winter Olympics in Sochi.